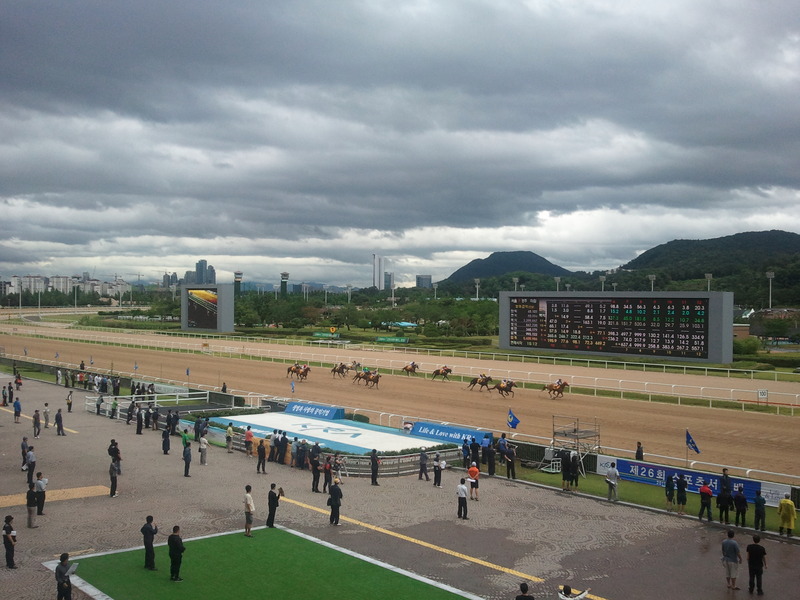 Under an angry sky at Seoul Race Park this afternoon Sen Girl, a 7/1 chance, took victory in the Sports Seoul Cup and in the process put herself among the favourites for the Korean Oaks this coming August. Sunday’s racing began in the monsoon rain that has lashed the peninsula non-stop since Wednesday, however, by the time the ten fillies took to the track for main event at 4:30pm, the rain had stopped and a brisk wind made for drying conditions. While Seungniuihamseong was sent off the even money favourite, it was Mustang Queen and champion jockey Cho Kyoung Ho who set the early pace. 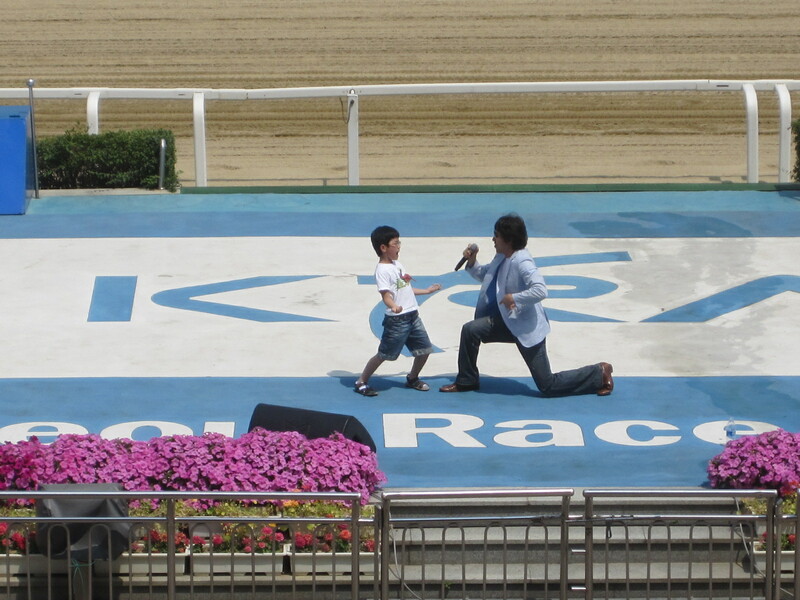 As they began the long turn for home, veteran jockey Kim Ok Sung brought Sen Girl around the field to take the lead. While Mustang Queen fought back bitterly in the home straight, it was a lead they wouldn’t relinquish and Sen Girl held on to win by a neck on the line to claim the 108 Million Won first prize and punch her ticket to the Oaks at Busan. Behind Mustang Queen, Allegrissmo was a distant third. Sen Girl is just one of twenty foals to be produced by the sire Strodes Creek (Halo) during his spell in Korea before his untimely death in 2008. Imported from Japan in late 2006, Strodes Creek stood for just one season before his tragic paddock accident. Three of that crop were in this race with Cheonupilseung and Event Queen finishing fifth and sixth respectively. 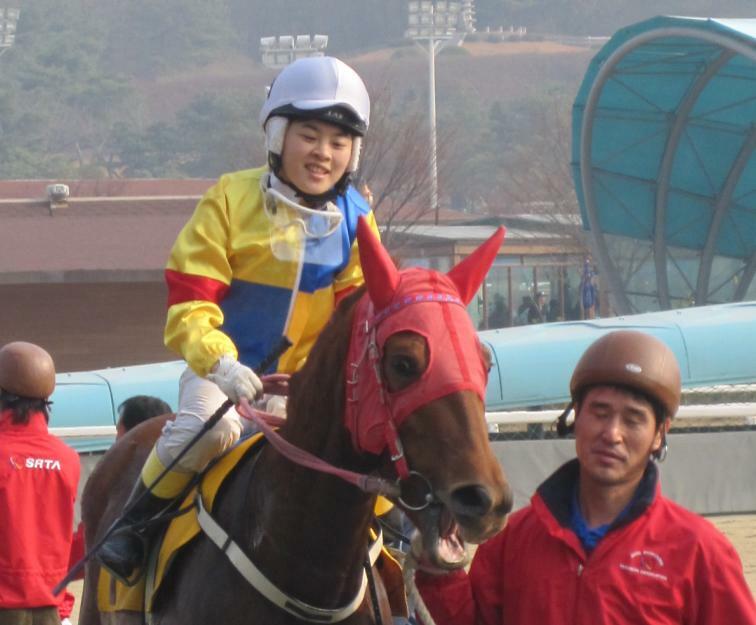 It was also a milestone day for jockey Kim Ok Sung. Kim had his license cancelled last year after being accused of passing along inside information. After serving a six month ban, he returned to action last month. Although accused of a crime that punters hate more than almost anything, Kim remains exceptionally popular with race fans in Korea. It could be his ever-present grin and willingness to engage in paddock banter that causes this – since his return punters are forever asking him for a tip. Or it could be the fact that he’s one the most experienced riders in the weighing room and punters like familiarity. Perhaps though, it’s more to do with the fact that unlike the young professional athletes he rides alongside these days, he simply looks as though he enjoys a spot of soju and Sam-gyeop-sal and that if he wasn’t riding, he’d be queuing at the betting windows along with everyone else. Whatever the reason, it seems great to have him back. Saturday at Seoul saw Kim Hae Sun add to her reputation as one of Korea’s most promising young jockeys as she rode a pair of winners in the monsoon rain. Having partnered favourite Nice Active to victory in race 7, she then scored in the first of co-feature races on three-year old colt I’d Rather B Lucky (Gibson County). Kim, who debuted two years ago, has now ridden 26 winners from 450 rides. 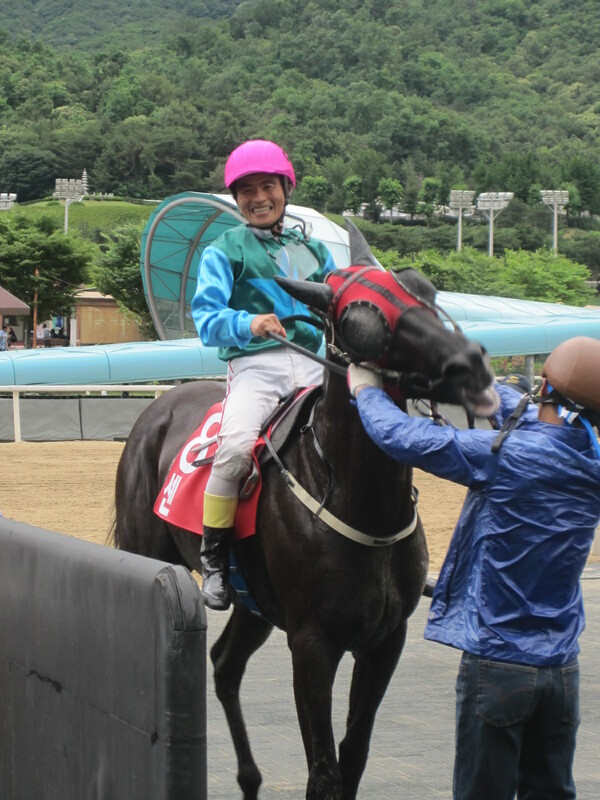 There was also a rare winner for Kim’s fellow female rider Lee Ae Li, who claimed the last on 9/1 shot Victory Camp. In other races, there were victories for last year’s Gyeonggi Governor’s Cup winner Magic Party (Artie Schiller) and also for Sun Best (Woke Up Dreamin), who saw off Derby also rans Yeongung Icheon and Geuma Champ in race 9. Meanwhile, much earlier in the day, New Zealand bred two-year old Mister Captain (Captain Rio) recorded his second win in his second outing as he comfrotabel defeated dubut-making Smarty Jones colt Smarty Moonhak in race 4. Has won three out of her last four including last time out over the Oaks distance of 1800 metres. She will be the clear favourite. Well beaten behind Event Queen last time out and will be an outsider here. Another outsider, she won well last time out. Came close to Seungniuihamseong last time and is likely to be one of her main rivals here. Showed promise earlier this year but struggled over this distance in her last race. The unknown quantity in the race. Her two wins have been at five and six furlongs but if she gets the trip, she could be a factor. Possibly the biggest danger to the favourite. She knows how to win and ran well over 1700 metres in her last race. Could the last crop of Strodes Creek include a Stakes winner? He’s got three in this race Sen Girl is the most useful of them and while she is without a win in three, they have been against good horses. Also has no problems getting the distance. Broke her maiden last time out over six furlongs after repeated second place finishes. While improving, there should be better fillies here. Won well last time out but as yet hasn’t beaten a lot. An outside chance of a place. There are many great things about living in Korea – the people, the food, the natural beauty, the technology, the er..music, to name just a few. The weather is not on that list. The snow of January may now be a distant memory but instead, we have monsoon season! This year’s downpours began on Wednesday and quite spectacular they have been too. The rain is forecast to continue throughout the weekend at all three tracks with perhaps the odd thunderstorm too to liven things up. 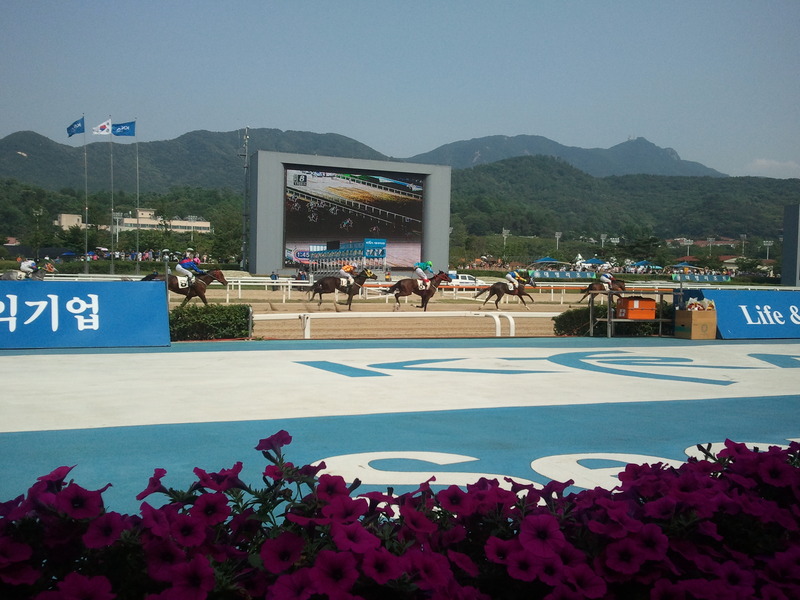 Racing continues of course with the headline event being the Sports Seoul Cup at Seoul Race Park on Sunday. The race, for Korean bred three-year old fillies, is one of the main trials for the Korean Oaks which will be run at Busan in August. While the track isn’t necessarily the greatest place to be during a monsoon downpour – home generally is – it’s no reason to stay away. 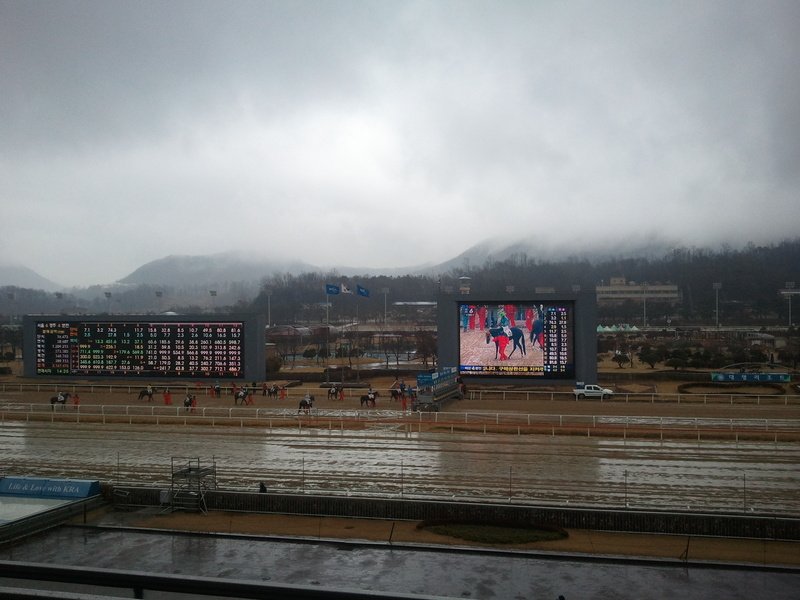 At Seoul, ,there is plenty of non-smoking outside covered seating on the second and third floors of the Happyville Grandstand. Here’s what’s happening when and where. * Blogging has been unavoidably light recently but normal service will be resumed shortly and if possible, we’ll aim to have a full run-down of the Sports Seoul line-up on Saturday evening. A mismatch isn’t easy to celebrate. Certainly very few punters were as Mister Park’s victory at Busan today paid out at a rate of 1.0 – that is, those who bet on him got their money back, but no more. Nevertheless, this demolition job took the Grand Prix Champion onto fifteen straight wins, equal with two greats of Korean racing, Po Gyeong Seon and Saegangja. A horse can only beat what is put in front of him or her and Mister Park (Ecton Park) has certainly done that. However, of his fifteen wins, only the Grand Prix – admittedly the biggest of them all – was a Stakes race and on only one other occasion was he asked to take on foreign bred horses. Today’s victory was as routine as it gets. Jockey Yoo Hyun Myung took Mister Park into the lead straight out of the gate and accelerated away from the field as they entered the home straight. Ten lengths was the distance jockey Yoo opted to win by. It could have been thirty. The record will surely come next time out and after that is when it should get interesting. Mister Park’s handicap mark should render staying competing against domestic bred horses impractical in all but Stakes races. Then we’ll have some fun. Up in Seoul, there was another finding the going pretty easy today. Ace Galloper (Chapel Royal) is just like Mister Park in that he is Korean born but not bred (in that his dam was imported to Korean while pregnant) and therefore wasn’t eligible for the three-year old Classics last year and also in that he has been campaigned rather conservatively. This afternoon in the feature race in the Capital, he took on Top Point, former Champion filly & mare. While Top Point took an early lead, Cho Kyoung Ho produced a masterful ride on Ace Galloper to come through and take the victory by a comfortable three lengths. Ace Galloper moves onto thirteen wins from nineteen starts. Oh but would he and Mister Park race each other. 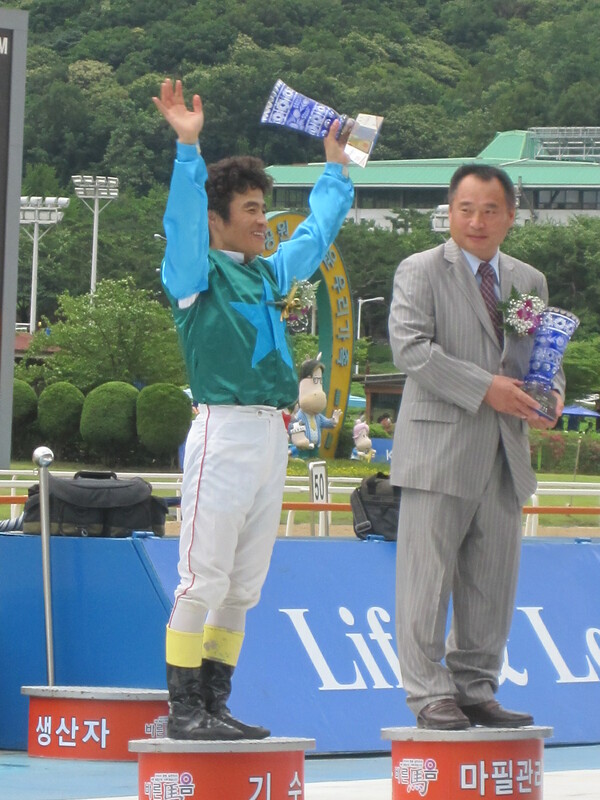 In other races, Japanese jockeys Mai Beppu and Makoto Noda both registered their first place finishes. 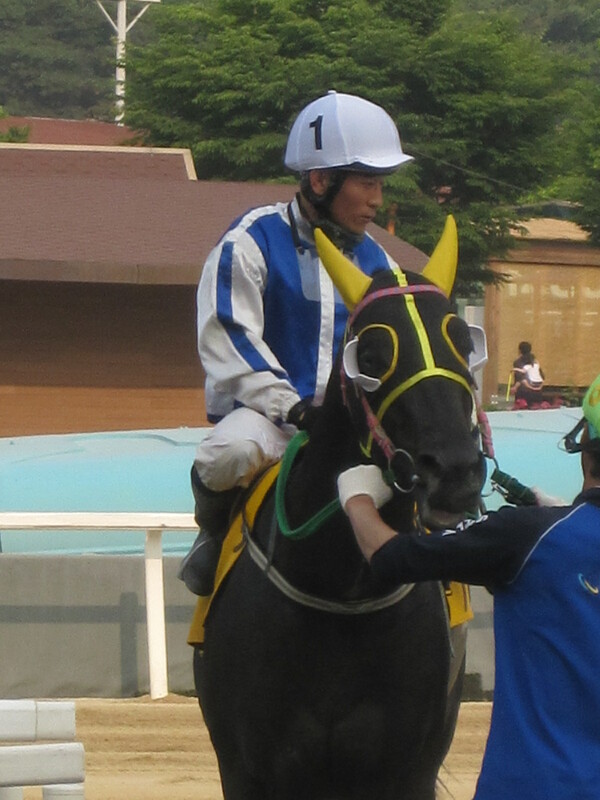 Beppu had made her Korean riding debut nearly two months ago but got injured on only her second day. Returning this weekend, she managed a second and a third place. Meanwhile, Noda was making his debut and on his thirteenth and final ride of the weekend, scored a very unlikely third place on longshot Silk Road in the last today. Both jockeys seemed to get the quantity but not the quality in their rides this weekend. Their countryman Hiro Hamada, who joined them in a couple of races today, has been riding in Korea for more than a year now and, while arguably one of the best riders at the track, these days receives neither quality nor quantity to ride. Such is the life for a foreign jockey in Korea. Racing returns to the peninsula next weekend when we will have Stakes action in the form of the Sports Seoul Cup. He’d already won the Governor’s Cup, The Minister’s Cup, The President’s Cup and the Ttukseom Cup and today, Dangdae Bulpae was in imperious form as he soundly defeated the best of his peers to win the KNN Cup at Busan Race Park. Almost all of Busan’s top Korean bred horses were there. Cheonnyeon Daero won the Derby last year before stablemate Dangdae Bulpae, hit his stride. He was the one who got closest to the winner today. However, “closest” is a relative thing when the winner was eased down yet still finished ten lengths ahead of everyone else. Battling into third place was the 2008 Derby winner Ebony Storm. Now a gelding, the six-year-old showed at the front early and stayed on well to beat out Triple Sinhwa, who came close in all three Classics last year. Disappointment of the race was Yeonseung Daero. Pre-race he was considered Dangdae Bulpae’s biggest threat but, while seemingly well placed as they entered the home straight, the five-year old faded badly to finish out of the money. Also running below-par was Lucky Dancer, meaning the wait goes on for Aussie trainer Peter Wolsley to saddle a Korean Stakes winner. 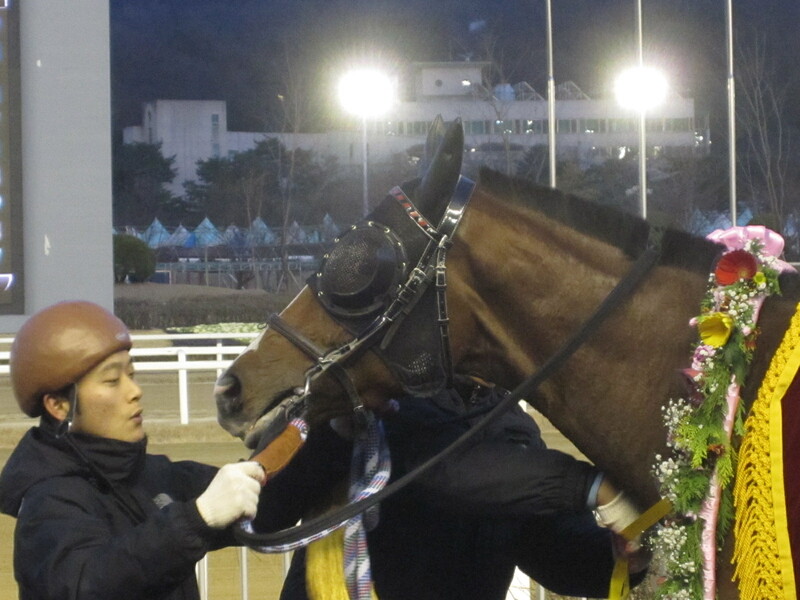 As for Dangdae Bulpae, it was his twelfth win from seventeen starts and his fifth Stakes. Only one horse stands between him and being the undisputed top Korean bred horse in the country. Mister Park couldn’t run today by virtue of having been sired overseas. Last time they clashed, in the Grand Prix at Seoul, Mister Park won. Their next meeting promises to be very interesting indeed. 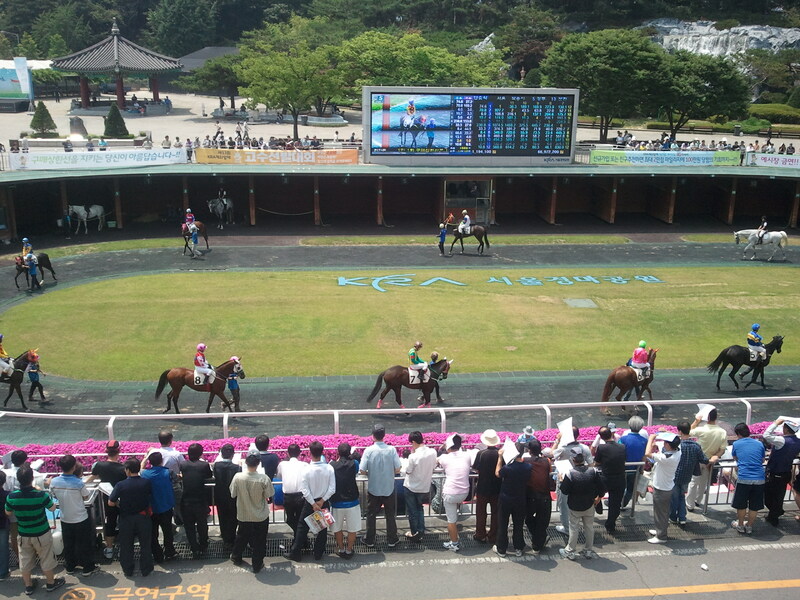 Up at Seoul there was also Stakes action in the shape of the Seoul Racehorse Owners’ Association Trophy, one of the biggest races of the year for foreign bred fillies and mares. 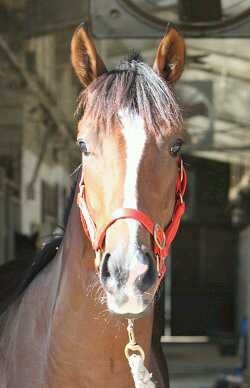 This year three Korean bred fillies also took their chance. However, while Love Cat, Cheonun and Raon Glory were all sent off among the favourites, it was imports who swept the placings. 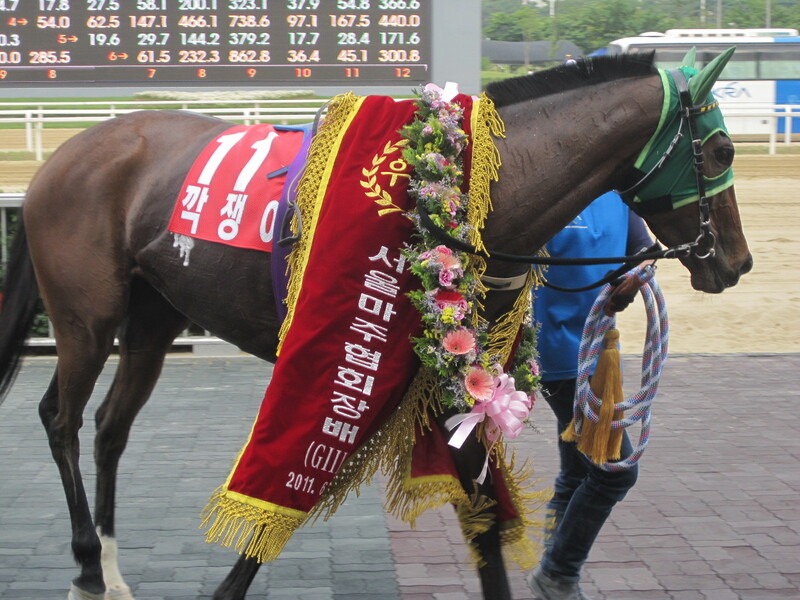 In the end it was Segye Ilbo Cup winner Kkakjaengi who took her second Stakes victory of the year as she comfortably held off pre-race favourite Geumbi to take a two-length win. Long-shot Imperial Girl completed the placings with Cheonun coming home fourth. who just seems to get better and better. Ft. Stockton [Cure The Blues – Tai The Devil (Tai)], one of the nation’s longest-serving and most successful sires, is dead. The nineteen year old died suddenly at stud on May 30. Seemingly in good health, Ft Stockton had been performing stallion duties up until the day before he was found dead. The cause of death given is a ruptured Pulmonary Artery. As a racehorse in his native United States, Ft. Stockton won the Jersey Shore Breeders’ Cup and Hirsch Jacobs Stakes as a three-year old and the Arlington Breeders’ Cup Sprint Handicap at four, retiring with seven wins from his thirty-one starts. 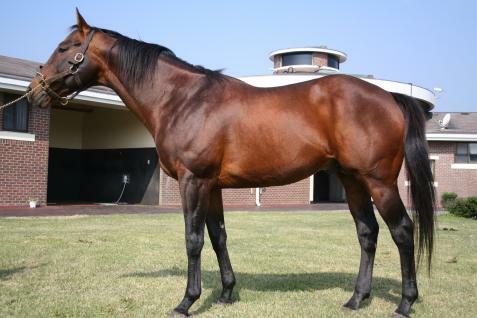 In more than a decade at stud, Ft. Stockton has sired some outstanding Korean racehorses including 2005 President’s Cup winner French Dancer and 2009 Minister’s Cup winner and Korean Guineas and Derby runner-up, Namdo Jeap. However, there is one horse in particular that Ft. Stockton will be remembered for. J.S. Hold (out of the Passetreul mare Hwansangjiljoo) was, in Korean racing terms, exceptional. Winning nine of his ten races, he completed the inaugural Triple Crown in 2007 including a ten length triumph in the Derby. Only 75% fit for the Minister’s Cup, the final leg of the Crown, J.s. Hold still managed to battle to victory. The injury didn’t heal and he was retired having secured his place as arguably Korea’s greatest ever home-produced racehorse. Ft. Stockton’s legacy will continue. He’s represented in both of this weekend’s big Stakes races; Annika Queen takes part in the KNN Cup at Busan while last year’s Korean Oaks runner-up Cheonun takes her chance in the Owners’ Trophy at Seoul. With nearly three more crops of foals to reach the track, he may be gone but it will be a long time before Ft. Stockton’s impact on Korean horse racing is forgotten. Ft. Stockton is the third high-profile stallion to pass away in Korea this year following the deaths of Yankee Victor and The Groom Is Red. – Ft. Stockton’s Pedigree Query page and his Korean Stud Book entry.